Ridge walkers need to be aware of the Change to the Glenelg entrance to the National Park. So take a look now. The above change means that the overall length of the ridge walk, from Bluff Knoll car park to Gnowellen Road, is 25kms. An increase of 6kms. Of course this won't affect walkers who are returning to Bluff Knoll Road along the boundary fence track. The water barrel on 3rd Arrow is continuing to run dry at times and can not be relied on. Extra water supplies need to be carried. Of all the peaks along the ridge walk, First Arrow is by far the most difficult to negotiate. A maize of ill-defined trails intertwine the rocky crags; many of them made by hopelessly lost walkers. The following download describes the clearest route to follow. Walkers heading west from Baker’s Knob should skirt the northern side of the small rock turret in the saddle, then return to the crest of the ridge and follow it up towards Little Arrow. An ever increasing number of ridge walkers are blazing a trail descending north west from the rock turret, and ending up hopelesssly lost. The following download clarifies this. The trail up the northern ridge, below Ellen's Peak is clearly visible from the Moir Hill track, and some walkers try and take a short cut by following the Moir hill track past the north east track and then cutting across the creek to the foot of the Northern Ridge. They soon realise their mistake when trying to extricate themselves from the thick mallee. The easiest route is to follow the north east track west for about 1 kilometre from the Moir Hill track and pick up the trail 80 metres past the creek. 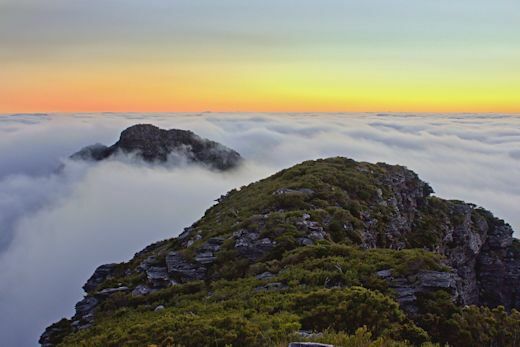 The Stirling Ridge walk follows an ill defined trail over the spectacular mountain peaks between Bluff Knoll and Ellen's Peak. Most walkers take three days to complete the walk, allowing themselves time to appreciate the natural beauty of this unique environment. Hikers should have good navigation skills and be prepared for steep rock and severe weather. It's a classic mountain walk and becoming increasingly popular; however, the high peaks of the Stirling Ridge are also home to a community of plants that exist nowhere else in the world. We need to tread lightly when venturing into the mountains in order to minimise our impact on this fragile environment. The Ridge Walk photo gallery The high peaks of the Stirling Ridge frequently interact with the clouds, sometimes in spectacular fashion. In January this year, I was lucky enough to be on the summit of Pyungoorup Peak at dawn, to witness this incredible show. How tough is the Stirling Ridge walk? The ridge walk is a true mountain walk. You will encounter very steep gradients with long hauls up steep loose gravel. Some rock scrambling is required; this is where you need to use your hands as well as your legs to scale simple rock climbs. On First Arrow you will be expected to clamber along tight rocky shelves while exposed to vertical rock precipices. A short length of rope is useful here to haul those heavy rucksacks up and down these sections. There is no track. A vague trail can be followed over most of the walk, but this is easily lost. Some walkers have constructed cairns to help guide others over the more difficult sections of the walk, but then there are those that go round knocking these cairns down. Low cloud frequently engulfs the ridge, bringing visibility down to a few metres; careful compass work is essential. The weather can change very quickly and strong winds and driving rain will test the best of equipment. You’ll soon discover that those gore-tex jackets aren’t as waterproof as you thought. In short the ridge walk is very tough. Compared to the Stirling Ridge walk, the Bibulmun track is a Sunday afternoon stroll. The easiest way is to start from the Bluff Knoll car park. This gives you a starting point of 450 metres and the climb up Bluff Knoll, though steep, is on a well formed path. As you walk east you will encounter several steep climbs through thick bush, but they are all relatively short. You can then finish the walk at Gnowellen Road at the eastern end of the national park, or walk back along the north east boundary fence to the start of Bluff Knoll Road. The latter option requires a shorter car shuttle to retrieve your car from the car park at Bluff Knoll. Alternatively, you can take the eastern approach to the ridge walk, climbing Ellen's Peak first and then following the ridge to Bluff Knoll. The starting point in this case is at the revised eastern entrance to the national park at Gnowellen Road, elevation just under 200 metres. Walkers then face a long hard slog to gain the summit of Ellen's Peak. The final climb up Bluff Knoll from Moongoongoonderup ridge is also very trying. When finally you reach the car park at the foot of Bluff Knoll you then have to retrieve your car at Gnowellen road. The option I usually take is probably the toughest of all. I leave my car at the junction of Bluff Knoll Road and Chester Pass road and walk along the north east boundary fence to the start of the trail up Ellen's Peak. I usually pick up water at the creek that crosses the North Mirlpunda track, and set up my first nights camp somewhere on the climb up to Ellen's Peak. My second nights camp would either be in the cave on Third Arrow (if the weather is bad), or in the Sheoak col between First Arrow and Pyungoorup Peak. The third day ends with the laborious climb up to Bluff Knoll from the Moongoongoonderup ridge followed by the painful walk back along Bluff Knoll road. This route requires no car shuttles. Apart from the starting points at Bluff Knoll and Ellen’s peak, the two other points at which the ridge walk can be exited are from First Arrow down to the North Mirlpunda track, and from the Moongoongoonderup ridge down to the North Isongerup track. Neither of these are easy escape routes, but they are the only ones that should be considered. The latter is particularly difficult to find when immersed in low cloud. Moongoongoonderup ridge is a series of indistinct knolls and if you hope to find the North Isongerup track, it’s vital that you descend the correct knoll. A GPS would be very useful here. The descent is very steep and there is no track or trail of any description until you reach the firebreak track. The North Isongerup track is overgrown and washed out in places, but still navigable on foot. The Water Barrel on Third Arrow. The water barrel on Third Arrow was originally installed by the Australian Army in the days when they carried out training exercises in the Stirling Range. It is located in a cavern high up in the cleft between the main peak and central buttress, where it collects drips from the roof of the cavern. Originally, water was syphoned from the barrel using a length of plastic tubing; however, to reach the barrel, walkers had to scale a short rock-climb. Someone installed a length of fixed rope to assist them in this, but no maintenance was ever carried out on the rope and fears were raised about its safety. In 2004, CALM attached a length of polythene pipe to the barrel so that water could be obtained from a plastic tap just below the rock climb. The system served bushwalkers well for many years, but is now proving to be unreliable. The barrel is a 44 gallon drum collecting drips from the roof of a cave and not a large rain water tank collecting water, gushing from a tin roof. The supply of water is always going to be limited. It is inevitable that increasing numbers of people traversing the Stirling Ridge will place a strain on this supply. Climate change is also playing a significant role in reducing the availability of water throughout the Stirling Range. There may be more specific causes for water shortages in the barrel. Someone may have accidently tugged on the polythene pipe, dislodging the barrel slightly so it collects fewer drips. There may be a small leak somewhere in the polythene piping. The barrel is some distance above the rock pitch so water pressure in the piping is always quite high, even when the barrel is nearly empty. This may explain the full one day, empty the next phenomenon, reported by some ridge walkers. What this all means is that walkers will need to carry more water when they set out on the ridge walk. The creek crossing the North Mirlpunda track carries water well into spring, but completely dries up in summer. The drip next to the cave on Pyungoorup Peak also carries water well into spring, though it is just a drip and it can take several hours to collect an appreciable quantity of water. Anywhere along the ridge, although the caves on Mirlpunda and on the southern side of Pyungoorup Peak remain the favourite places for overnight halts. The advantage of the caves is that you don't need to carry a tent. However, if you're setting out from Bluff Knoll car park, an early start is required to reach the cave on First Arrow. Note that this is a small cave and many hikers have expressed concern at a large crack in its roof. Hikers setting out from Gnowellen Road should be able to reach the cave on Pyungoorup Peak on the first day. Good camping sites can be found along Moongoongoonderup Hill and in the col between Isongerup Peak and First Arrow. The best camp site along the ridge would have to be in amongst the sheoaks between Bakers Knob and Pyungoorup Pinnacle. The saddle between the north east shoulder of Ellen's Peak and the northern ridge also seems to be quite popular. In order to keep the weight down, many walkers choose not to carry a tent, but rather to rely on the mountain caves for shelter. However, some sort of emergency shelter should always be carried, even if it's just a survival bag. These bags should be kept in their original wrapping and not used as ground sheets. They are for emergency use only. The bivvy bag is a good compromise. If you arrive at the cave on Third Arrow on some long weekend, to find that it's already full to the brim. There is a smaller cave below the east pinnacle, see page 93 in your guide book. It's right at the foot of the pinnacle and to reach it follow the base of the rock down, you'll find a long narrow overhang that can be used as a shelter. Mountain Walks in the Stirling Range Part 2 gives full details of the Stirling Ridge Walk. Mountain Walks in the Stirling Range Part 2 has now sold out.